I have a ton of unfinished posts that should have appeared on this blog weeks, months, even years ago. A lot of the time I’ll write something and not finish it – sometimes I lose interest, or I have to go to class, or I decide to go eat something and forget about it. And when this happens, the drafts remain in my blog dashboard, gathering dust while the other, more prominent posts see the light of day. I have a good ten or twelve posts that were never published. I think they are starting to get antsy. Well, I started writing them, so I might as well finish them. This week I’ll publish five unfinished posts – one each day from Monday through Friday. Keep in mind – these posts were written a long time ago, so don’t read them as if they’re in the present. I edited them for clarity’s sake, but most of these posts had already been written in their entirety. It’s been a crazy few weeks for Raul Ibanez and the Yankees. September 22nd: Ibanez pinch hits in the 5th inning and homers. Then, in the 14th inning, Ibanez caps off a four-run comeback by hitting a home run off Pat Neshek. The Yankees eventually win the game. October 2nd: Ibanez pinch hits in the 9th inning and homers to tie the game off Andrew Bailey. Then, in the 12th, he hits a single through the infield to score Ichiro, which gives the Yankees an important win in the penultimate game of the regular season. 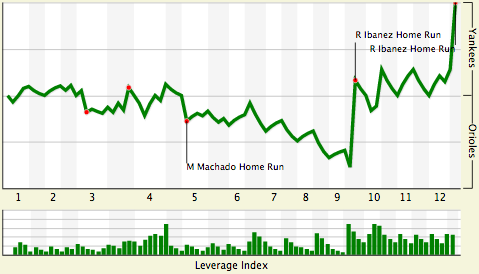 October 10th: Ibanez pinch hits for Alex Rodriguez in the 9th inning and homers to tie the game off Jim Johnson. Then, in the 12th, he hits a walk-off home run to give the Yankees a 2-1 lead in the ALDS. So, in the span of eight days, Ibanez pinch hit in the ninth inning, hit a game-tying home run, and then had a walk-off hit in the 12th … TWICE. And in the span of three weeks, he hit three game-tying home runs in the ninth inning or later. But, of course, he wasn’t done. In Game 1 of the ALCS, Raul capped off another four-run comeback by hitting another game-tying home run in the ninth inning, this time against Jose Valverde. What makes this so special is that Raul Ibanez is 40 years old and only hit .240 in 2012. It was one of his worst seasons statistically. But he made his hits count. In addition to the above, he also had a go-ahead three-run home run on Opening Day, a go-ahead three-run home run against Felix Hernandez on 5/11, a game-tying three-run home run against the Mets on 6/23, and a go-ahead grand slam against the Blue Jays on 7/16. Raul is a thoughtful man. The line that reporters in Kansas City used about him was that he was the go-to guy on any story … except a story about Raul Ibanez. If you want to talk music or books or current events, he’s your guy. If you want to talk about what makes Derek Jeter special or why the Phillies were so good for a while there or how ballplayers are in awe of Ichiro, he will fill your notebook. If you want to talk about Raul Ibanez … you need to go somewhere else. It isn’t just humbleness, I don’t think. He has this deep commitment to the idea that he’s doing a job out there. You don’t ask the person who paints your house afterward what it felt like. “I just try not to do too much,” he always says. The YES Network’s Meredith Marakovits interviewed him afterward on the field, and I was waiting for him to say that he did not want to do too much. Marakovits asked him how it felt to be a hero not just once but twice. “I tried not to do too much,” he said, and I smiled and turned off the television. The baseball season is filled with a million stories. The Yankees can wrap up the division tonight with a victory, and if they do then this was perhaps the most memorable moment of all, and Raul Ibanez will be one of the heroes of the season. But, Raul, being Raul, would scoff at that and tell you (I’m sure) that everyone on the team is a hero. And that whatever success he’s been lucky enough to have came from never trying to do too much.